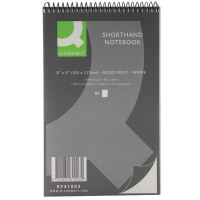 Each Q-Connect Shorthand Notebook has 80 sheets of quality ruled paper for taking down notes or memos quickly and easily. They feature a rigid cardboard back that provides a firm writing surface, even when away from a table or desk. The wirebound spine makes it easy to flip through pages for fast and efficient shorthand work.This pack includes 20 notebooks.